Founded 1862 as a patriotic society supporting President Lincoln’s efforts to preserve the Union. Recruited and financed troops during the Civil War. 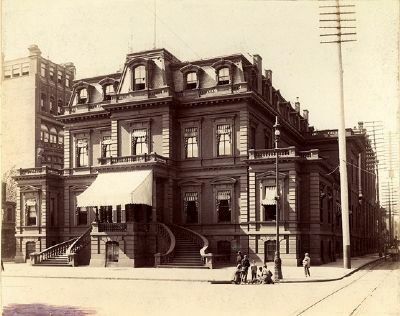 Its membership of prominent citizens later pursued political reform and social, philanthropic, and civic causes. Location. 39° 57.001′ N, 75° 9.856′ W. Marker is in Philadelphia, Pennsylvania, in Philadelphia County. 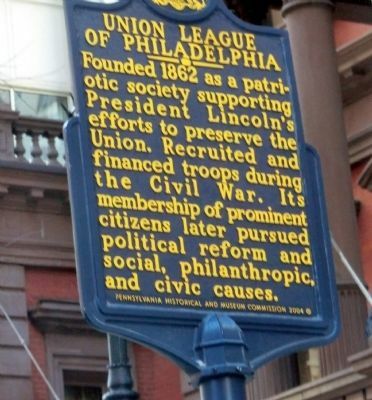 Marker is at the intersection of South Broad Street (Pennsylvania Route 611) and Sansom Street, on the right when traveling south on South Broad Street. Touch for map. 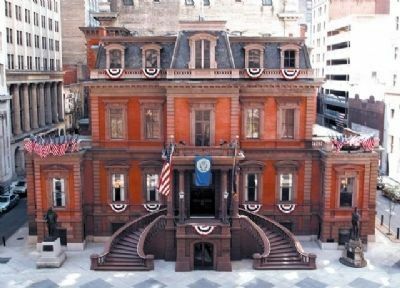 Marker is at or near this postal address: 140 South Broad Street, Philadelphia PA 19102, United States of America. Touch for directions. 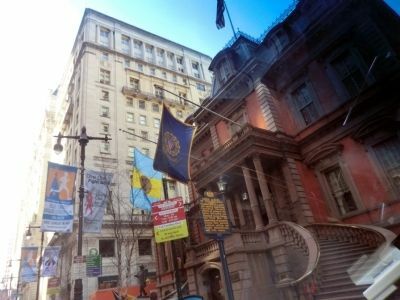 (about 700 feet away); Swedish Settlements on the Delaware (about 700 feet away); William McKinley (about 700 feet away); John Wanamaker (1838-1922) (about 800 feet away). Touch for a list and map of all markers in Philadelphia. More. 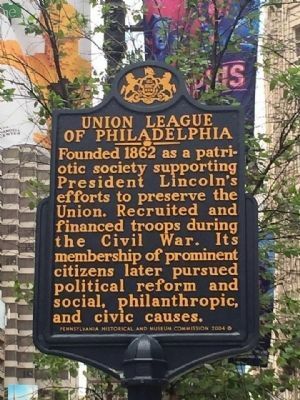 Search the internet for Union League of Philadelphia. Credits. This page was last revised on June 16, 2016. This page originally submitted on April 21, 2015, by Don Morfe of Baltimore, Maryland. This page has been viewed 259 times since then and 12 times this year. Photos: 1, 2. submitted on April 21, 2015, by Don Morfe of Baltimore, Maryland. 3, 4, 5. submitted on July 8, 2015, by Keith S Smith of West Chester, Pennsylvania. • Bernard Fisher was the editor who published this page.